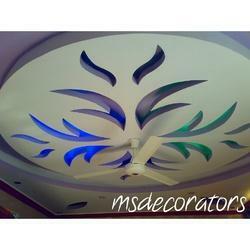 We are engaged as service provider to a wide range of Gypsum False Ceiling to our precious clients. In accordance with the set industry standards, our provided ceiling panel is precisely designed and manufactured using high grade Gypsum material and latest technology. Owing to its seamless finish and durability, this ceiling panel is widely appreciated by our precious clients. Moreover, to ensure the best quality, the offered ceiling panel is strictly tested by our skilled quality experts on different stages of quality parameters.